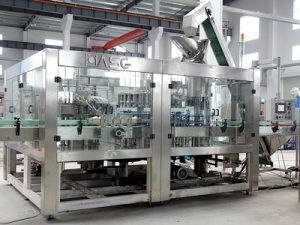 Fruit juice filling equipment bottle enters into the rinsing part of three-in-one machine through air conveyor. 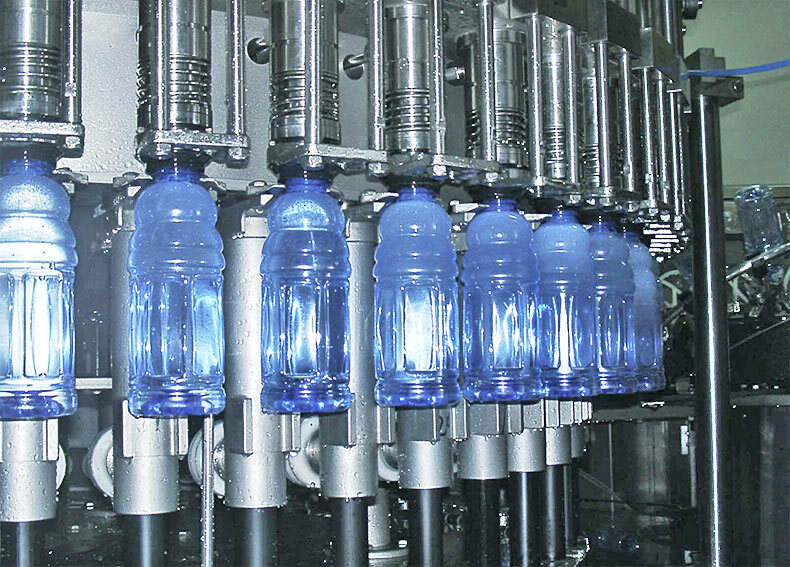 The gripper installed on the rotary disk catches bottle and turns it over 180 degrees and makes the bottleneck face ground. In the special rinsing area, the nozzle on the gripper sprays water to rinse bottle inwall. 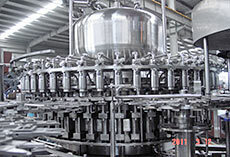 After rinsing and draining, the bottle turns over 180 degrees along the guide rail and make the bottleneck faces sky. 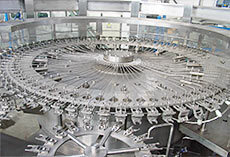 Then rinsed bottle is transferred to the filling part through poking bottle star-wheel. 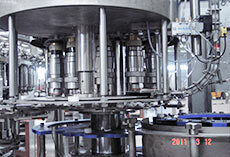 The bottle that enters into the filler is hold by neck holding plate. 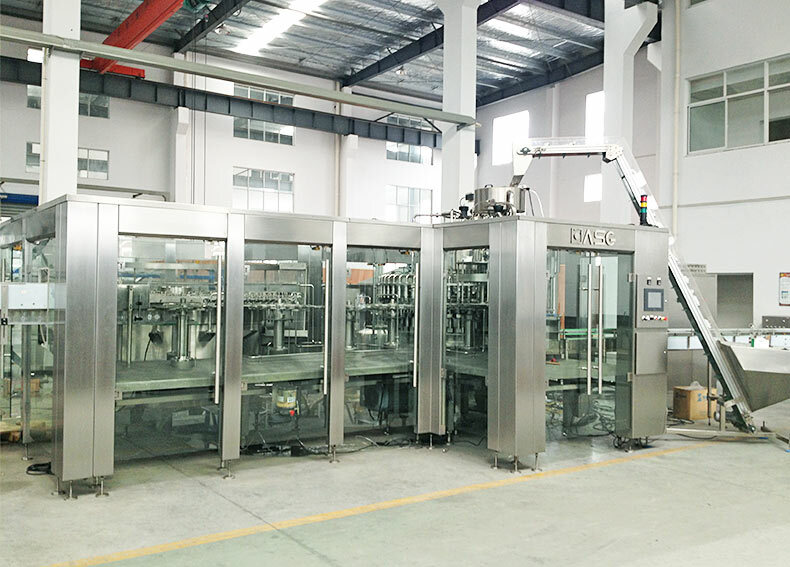 The juice filling machine valve acted by the cam can realize up and down. 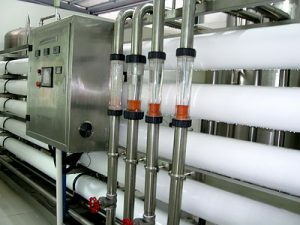 Juice filling equipment adopts pressure filling way. 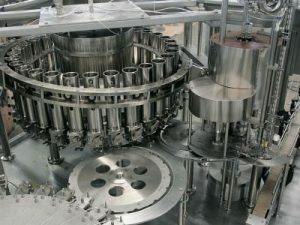 The juice filling machine valve opens and begins filling when it moves down and touches the bottleneck, the filling valve move up and leave the bottleneck when it finishes filling, the full bottle is transferred to the capping part through hold neck transition poking wheel. The stop screwing knife holds the bottleneck, keeps bottle upright not rotating. 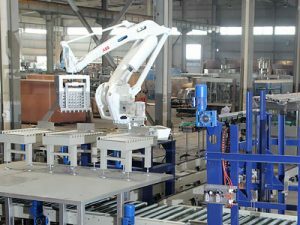 The screw capping head keeps in revolution and autorotation. 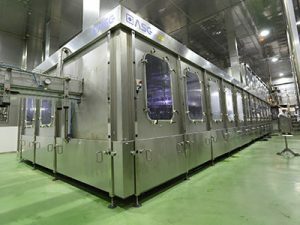 Fruit juice filling equipment can finish a whole capping course including catching, pressing, screwing, discharging through the action of the cam. The full bottle is transferred to bottle outlet conveyor to the next process through poking wheel. 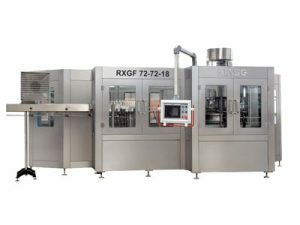 The whole machine is enclosed with windows, the height of enclosed window is higher than the peak of the 3 in 1 filling machine, in the bottom of the enclosed window has return air outlet.